Explore the full line of commercial vehicles from Bremerton’s Commercial Nissan Dealer serving all of Greater Seattle, Washington. You asked for it. And Nissan delivered. Available in V6 and V8 engines, the versatile NV Cargo van delivers a full-length, fully-boxed ladder frame with standard and high roof options. With an optional (High Roof)roof tall enough for a 6 foot 3 inch person to stand up straight in – the Nissan NV cargo line has excellent options and features for those who take their jobs very seriously. From optional 120 electrical outlets to its reinforced floor panels the NV stands high above competition from Ford, Chevy, and Dodge-Ram. At Advantage Nissan in Bremerton, WA – you’ll find Greater Seattle’s best selection and prices on all Nissan commercial vehicles. Exceptional cabin space, comfort and options—324 seat configurations to be exact. The Nissan NV is redefining the concept of a passenger van. Seat up to 12 passengers comfortably in a well-equipped Nissan NV Passenger van. Whether you’re running a livery business or a summer camp at one of our many fine Washington-state lakes, the Nissan NV Passenger has great features like stain resistent seating or full leather, analog or full power accessories. Compared to the competition from Ford, Chevy, or even Ram, there is no real competition. Stop by Advantage Nissan in Bremerton, WA to see our full-lineup of Nissan Commercial and Passenger vans. An expansive cargo area[*], easier accessibility, increased maneuverability – the NV200 Compact Cargo van delivers more flexibility without sacrificing a thing. Starting around $20,720 MSRP the Nissan NV200 Cargo comes standard with the cost and fuel-efficient 2.0-liter DOHC 4 cylinder engine. It’s continuously variable transmission ensures that shifts are smooth and consistent for excellent city and highway fuel-efficiency. The rear doors open 180 degrees offering easy access to the rear cargo area. 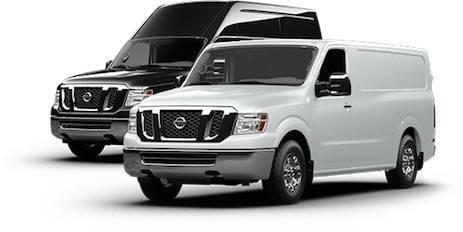 Come to Advantage Nissan in Bremerton, WA to see our exciting lineup of Nissan NV200 vehicles. Meet the NV200 Taxi. With features that improve the trip for passengers and drivers alike, the NV200 Taxi is an innovative new way to get around town. Conquer the competitive game of urban people moving in the surprisingly spacious Nissan NV200 Taxi. Whether you’re working for Lyft, Uber, or even if you’re an independent taxi service, the NV200 Taxi is a fantastic choice. Carrying a class-leading 150K mile warranty puts this Taxi on top of Ford Transit Connect and even the upcoming Chevy City Express. Come check a New NV200 Taxi today at Advantage Nissan in Bremerton, WA. Although the Nissan Frontier technically falls into the “small Truck” segment very little of it could be considered “small” with the only exception being it’s starting price of $17,990. The S trim version comes with a surprisingly powerful 2.5Liter 4 Cylinder Engine that delivers a good 23MPG highway or go for the biggest and best in the Nissan Frontier SV V-6 trim with a 261 Horsepower. Find the Nissan Frontier as well as a great selection used trucks (big and small) at Advantage Nissan in Bremerton, WA. What defines a “Truck”? Is it 317 Horsepower? Is it a V8 Engine standard. Is it the ability to tow a ton, or 4.75 of them? However you define a “Truck” you’ll find that the Nissan Titan checks all of the right boxes. If you’ve been curious about the Ford F-150, Chevy Silverado 1500, Ram Truck, or Toyota Tundra You NEED to come test-drive the Nissan Titan which is on sale now at Advantage Nissan. *Must have valid fleet certification code to qualify for Tier 1 or Tier 2 savings. Model years cannot be combined. Customers must have a completed Customer Fleet Agreement and a minimum of 16 units associated with their fleet certification code to qualify for Tier 2. If customer has a pre-existing fleet certification code and a current Model Year Customer Fleet Agreement, customer may qualify for higher tier level. See Dealer for details. Tier incentives cannot be combined with any retail incentives. Only Business Certified Nissan Dealers are eligible to sell commercial vehicles. See participating Dealer for details. **The deductions referenced are for informational purposes only. This information does not constitute tax or legal advice. All persons considering use of available deductions should consult with their own tax or legal professional to determine eligibility, specific amount of deductions available, if any, and further details. The deductions are not within Nissan’s control and are subject to change without notice. Interested parties should confirm the accuracy of the information before relying on it to make a purchase.